Happy hour is an excellent way to catch up with friends or wind down a busy workday. 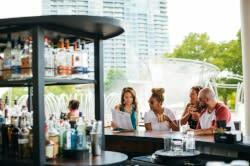 If your day’s ending a little earlier, we’ve rounded up some early happy hours that start at 3 or 4 p.m.! 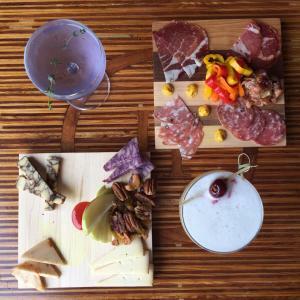 Tip Top Kitchen & Cocktails kicks off their happy hour at 3 p.m. weekdays. All Ohio drafts are $2, while Middle West and Watershed Distillery spirits are $3, and appetizers like nachos, corn fritters, feta spread, and red bean hummus are half off. The new South Village Grille in German Village offers a special happy hour Monday-Friday, 4-6 p.m. and Saturdays and Sundays from 3-4 p.m., with half off shareables, glasses of wine, and draft beer. Rockmill Tavern’s happy hour is 3-6 p.m. Tuesday-Friday, offering $10 sandwiches and half off select drinks. Bodega in Short North kicks off happy hour at 4 p.m. Monday through Friday, during which their selection of 47 draft beers are half off! 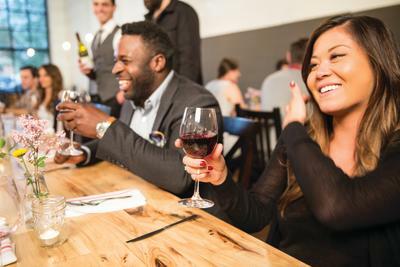 If wine is your choice of beverage, Tastings – A Wine Experience in Short North runs happy hour from 3-6 p.m.
Woodland’s Tavern has the perfect happy hour for craft beer fans. All drafts are $3 from 3-8 p.m. Monday through Saturday, while all domestic drafts and bottles, in addition to well drinks, are $2. In Italian Village, City Tavern serves up $4 drafts, $3 well drinks, $5 wine, and $2.50 domestic bottles. The Wolf’s Ridge taproom features a 3-7 p.m. happy hour Tuesday through Sunday. The restaurant offers $1 off glasses of wine and $2 off seasonal cocktails starting at 4 p.m.
Camelot Cellars in Olde Towne East offers $5 glasses of wine and $4 from 4-7 Tuesdays and Thursdays, and on Wednesdays they feature Wine Down Wednesday, where the staff curates a selection of five wines for $5. Marcella’s features a half price happy hour in the bar and cocktail lounge weekdays from 4-6 p.m.
Would you rather have a shot of caffeine for happy hour? Brioso Coffee offers the Dankest House from 2-4 p.m. weekdays at their Gay Street and Long Street locations. Drinks and baked goods are half off, while espresso and filtered drip coffee are only $1. And there are many more! Condado Tacos’ happy hour runs 4-7 p.m. daily, Little Palace’s happy hour is 4-7 p.m. from Monday to Friday, and more. What’s your favorite spot for an early happy hour?